This website is to inspire each other and offer tools to daily practice... LOVE . IMAGINE a world in Love. To live in a loving world, you need to live in Love. To do that you need to practice. I’ve been working on it and I’m inviting you to join me. That’s what Globalise Love is for. It’s an interactive website to promote the globalisation of Love as a practical and intelligent foundation for now and future humanity. In the last 50 years, we’ve globalised just about everything else but we seem to have forgotten the essential heart. Our western consumptive culture has taken us away from caring and sharing. By practicing Love in your daily life, you’ll at least be creating a loving life for yourself. You’ll find that with practice it gets easier. You’ll find yourself walking around with a smile on your face and you will Be in Love. Let’s grow it so the vine extends and bears fruit in all areas of humanity... corporate, political and, most importantly, your Life. We live in a very plastic world these days. That is, it’s being moulded and shaped at an ever increasing speed. Time itself is elastic. It’s challenging to keep your balance. 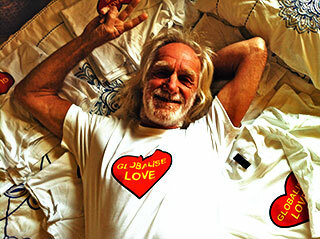 Be a part of a Global Love Community and spread the message of love with GlobaliseLove.com swag. The T’s are fun and look great but they’re also your tools to practice Love in your life... Please wear them with awareness. All our products are designed to support you in spreading the Love and your purchases fund the project. If you’d like to know the back story to Globalise Love check out our “about” page.